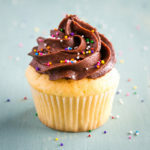 These Birthday Cake Cupcakes with Chocolate Frosting are the perfect moist and delicious yellow cupcakes with creamy chocolate buttercream and sprinkles! Preheat your oven to 325 degrees Fahrenheit and line a cupcake tin with paper liners. Mix in the oil and vanilla on low speed. Measure the milk into a liquid measuring cup and add the apple cider vinegar to the milk. Let stand while you measure the dry ingredients. Measure the flour, baking powder, baking soda and salt into a separate bowl and whisk together until combined. Add the flour and the milk mixture alternatively, mixing well after each addition. Add 1/3 of the flour mixture first, then 1/2 the milk mixture, another 1/3 of the flour mixture, the rest of the milk mixture and then the remainder of the flour. Be sure to mix well after each addition and scrape down the sides and bottom of the bowl regularly. Mix on medium high speed for about 1-2 more minutes after all the ingredients have been added. This will create a creamy-looking batter. Divide the batter between the prepared cupcake cups (this recipe makes about 30-36 cupcakes, depending on the size, so you'll have to bake in batches) and bake at 325 degrees Fahrenheit for about 18-21 minutes, or until a toothpick inserted into one of the cupcakes comes out clean. Cool the cupcakes in their tins for 5 minutes, and then remove them to a wire cooling rack to cool completely to room temperature before frosting. While the cupcakes are cooling completely to room temperature after baking, prepare the frosting. Whip the butter on medium-high speed until light and fluffy. Sift the powdered sugar and cocoa powder together and add to the butter about 1 cup at a time, mixing well after each addition. Scrape down the sides of the bowl well after each addition, and add the salt in with one of the cups of powdered sugar. After the powdered sugar has been added, you'll be left with a very thick frosting. Add the cream one tablespoon at a time until the frosting has reached a spreadable consistency or the appropriate consistency for piping. Pipe the frosting onto the completely cooled cupcakes using a piping bag and a star tip (or whatever tip you like! ), top with sprinkles, and serve! These cupcakes can be made one day in advance and are best stored in the fridge until 10-15 minutes before serving.